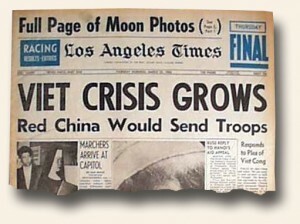 One of the attractions of collecting old newspapers is the ability to look at history with the benefit of hindsight. Many times writers were right on the money when it came to predicting events in the future; many times they could not have been more wrong. Both views offer interesting reading. Not long ago we came across a report of what would become a scar on the military history of the United States, specifically the lengthy war in Vietnam. 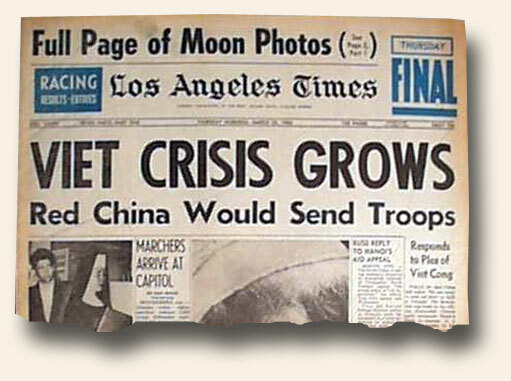 A “Los Angeles Times” newspaper as early as March 25, 1965, some ten years before the Vietnam War would officially end (Saigon fell on April 29, 1975) had a headline announcing: “VIET CRISIS GROWS“. This report notes that Red China was committed to sending troops to fight in Vietnam if the Americans persisted in their growing involvement, and that they would: “…fight together with the South Vietnamese people to annihilate the U.S. aggressors.” This is in response to the event of 3 weeks prior when the first American combat troops arrived in Vietnam, joining a force of 23,000 American “advisers”. American involvement in the Vietnam War would only continue to grow for another 8 years. I am sure almost no one who read this newspaper in the spring of 1965 could have guessed the future complexity and duration of American involvement in Southeast Asia. This issue constitutes half of what I would call “bookend newspapers”, or a pair of newspapers which report the beginning and end of noteworthy events.